View thousands online manuals, user’s guides or product specifications for free. UserManuals.tech is the biggest database of product manuals and user’s guides. We offer 1,762,469 manuals and guides from 52,491 brands for you to view or download. When you are having trouble with your appliance and it’s hard to find the paper original manual, you find all the responses to your questions on UserManuals.tech. It’s the unique source of manuals and service guides for free. All manuals are available for view for free without any registration. You easily find what you need in few seconds. You can download the manuals or user’s guides of all the 52,491 brands to your PC or print them. Get the advantages of bookmark the document with quick registration. If you want to view them later, you will easily find them in your account. Our large collection of product offer the manuals of thousands brands. When you have problem with your appliance and you can‘t find the original paper guide, UserManuals.tech will help you find available online manual, user’s guide or product specifications. You can view all these document for free. For keeping your manual bookmarked in your account don’t hesitate to make a registration on UserManuals.tech. You find the manual or user’s guide in a few seconds, you can search by brands, models or categories. View all the manuals and user’s guides online for free. Find the manual or user’s guide you need. Thousands manuals are available to download and print. Tell your friends about UserManuals.tech. You can share all the documents on Facebook, Twitter or Google+. Sing up to get access to your favourite documents. You will be able to easily view them later. If you don't find the manual or user's guide you need, don’t hesitate to contact us and we'll try to find the corresponding documents for you. Thanks UserManuals.tech I’am able to resolve all the troubles with my appliances. All the information are easy to find in a few seconds. Unfortunately I loose the original paper user manual of my office printer, but the manual from UserManuals.tech help me find all the setting information. Thank you for support, even if the brand of my appliance wasn’t of the large database of manuals, the team of UserManuals.tech take care of it and find the missing available document for me. 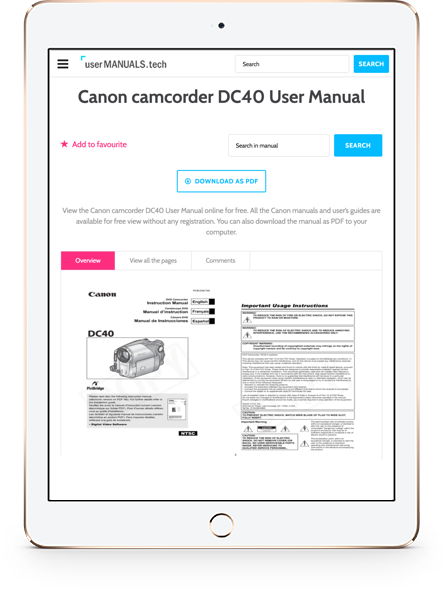 Register on UserManuals.tech to get all the information of technical product manuals and user’s guides and profit of all the advantage for free.